Fresh from commentating on the Tour de France and Ride London, David Millar joined us for our latest event. 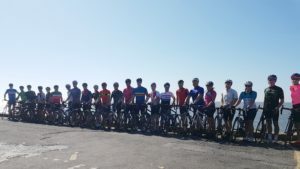 Thursday 21st September saw Cyclone24 host another corporate ride out which consisted of a 105km ride through Cardiff, the Vale of Glamorgan and a route over the Bwlch. A joint event organised with Brewin Wales and Darwin Gray, 66 cyclists joined us as we set off from Cardiff Arms Park. Heading out early in the afternoon, the rain had stopped and the sun was shining, perfect riding conditions some called it. With the briefing over and energy bars collected, the first group headed out of Cardiff bound for the Bwlch, with group two leaving shortly afterwards heading out towards Miskin and onward to Ogmore by Sea to take in those beautiful coastal views. Around 3pm the first of the groups arrived in Llantwit Major where we had organised a pit stop at the wonderful Café Velo. Welcomed by cake and coffee, along with additional nutritional gels and bars, it was a much welcome stop off. Then it was onward, returning to Cardiff Arms Park for some well-earned beers and BBQ before David Millar entertained our guests with a fascinating and very candid talk about his cycling career. David is former British National Road Champion and Time Trial Champion, the only British Rider to have worn all the Leaders’ Jerseys from the Tour de France and one of only six British riders to have worn the Yellow Jersey. He was also the first of only two British riders ever to have worn the Leader’s Jersey in all three Grand Tours. Millar was banned for two years in 2004 after admitting taking performance enhancing drugs. During that time and upon his return to cycling in 2006, he worked with WADA and UKAD on anti-doping initiatives and has become a voice for anti-doping within the sport. His final chapter in cycling saw him win Silver in the World Championships, stages of all three Grand Tours and write a best-selling autobiography. David retired from cycling at the end of 2014 but remains actively involved in the sport. The evening concluded with David giving each of our guests a signed copy of his book. 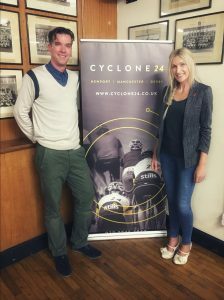 Cyclone24 would like to thank Brewin Dolphin and Darwin Gray, Alison Tait, Geraint Hampson-Jones and Owen John in the organisation of this event, along with all our guests for joining us on the day. We’d also like to thank David Millar’s sister, as it appears it is mainly thanks to her that we see and hear David commentating as much as we do!